Out team checks out some petroglyphs at the famous Gault Site. It is a common belief among non-Texans that we have too much pride in our state, but I personally believe that we Texans don’t have enough pride and today’s edition of Beyond Bones provides good justification for that opinion. 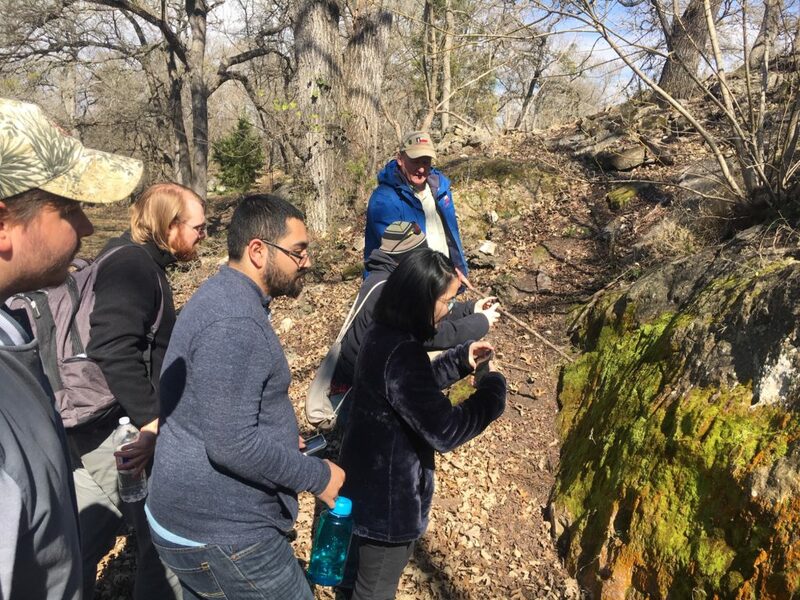 Last week I was lucky enough to get the chance to tag along when our Discovery Guide team visited the world famous Gault Site in central Texas. The visit included a tour led by Dr. D. Clarke Werneke, the Executive Director of the Gault School. This was a special trip for me because the Gault site is where I got my first field experience in archaeology. I briefly volunteered at the site while major excavations were still underway 15 years ago. The weekend I spent there was always a source of pride for me because Gault is one of the most important archaeological sites in the Americas and it’s not every day you get to participate in the forging of new history. I had not been back to the spot since then and was excited to hear about what new discoveries have been made since I was last there. An unfinished spear point several thousand years old. 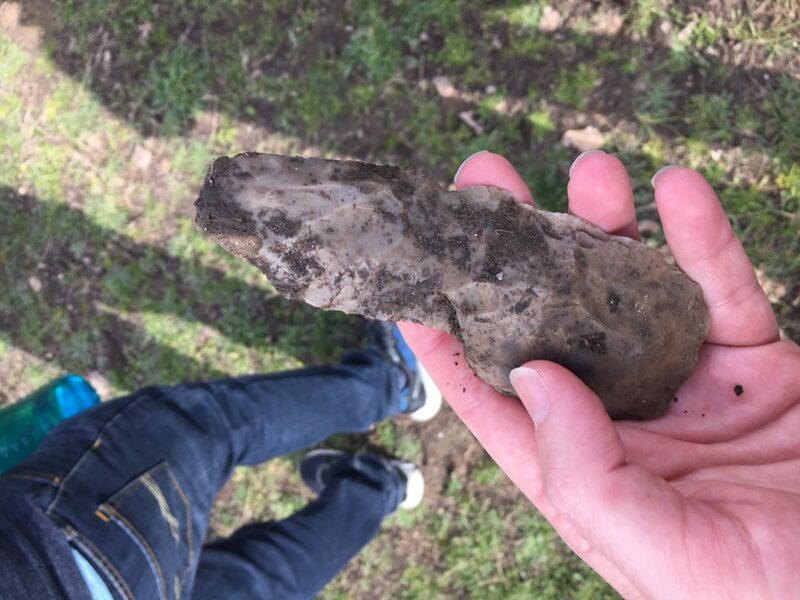 Alex, supervisor of the Discovery Guides found it half buried next to his foot as we stood talking to Dr. Werneke. The site is unimpressive at first glance. It’s a patch of desolate looking scrubland about 40 miles outside of Austin. Gnarly looking mesquite trees rise above parched earth scattered with crumbling limestone boulders. Cows browse lazily here and there. It’s a typical Central Texas rural scene. It takes a little bit of training to appreciate the site. Dr. Werneke picks up a small sliver of a glass-like rock called chert and holds it up for us to inspect. He points out unusual patterns on the lithic flake, a bulge in the center of the artifact and wave patterns formed by the force of impact of a toolmaker’s stone hammer. It’s a piece of what they call debitage, bits flaked off during the process of shaping a stone spear point. Once you know how to identify them you realize that you are surrounded by thousands and thousands of these little flakes, the result of thousands of years of toolmakers sitting in the same spot you’re standing now, creating the tools they needed during their every day life. The Gault Site was a paradise for prehistoric Americans. A permanent stream bubbles out from under the Edwards limestone, a porous layer of cretaceous rock that covers much of central Texas, and flows through the property. Today cows draw water from it, but 13,000 years ago some of the earliest people to inhabit the New World were taking advantage of the wide variety of edible flora and fauna supported by the stream in an otherwise desolate landscape. Not only was the site a great place to hunt and gather, it was also a source of high quality chert, perfect for fashioning tools out of. Not just spear points, but knives, axes, scrapers and carving tools. It’s the debitage and unfinished remnants of these tools that litter the site today. There you can literally touch history. Just bend down and pick up a rock and chances are it’s historically significant. 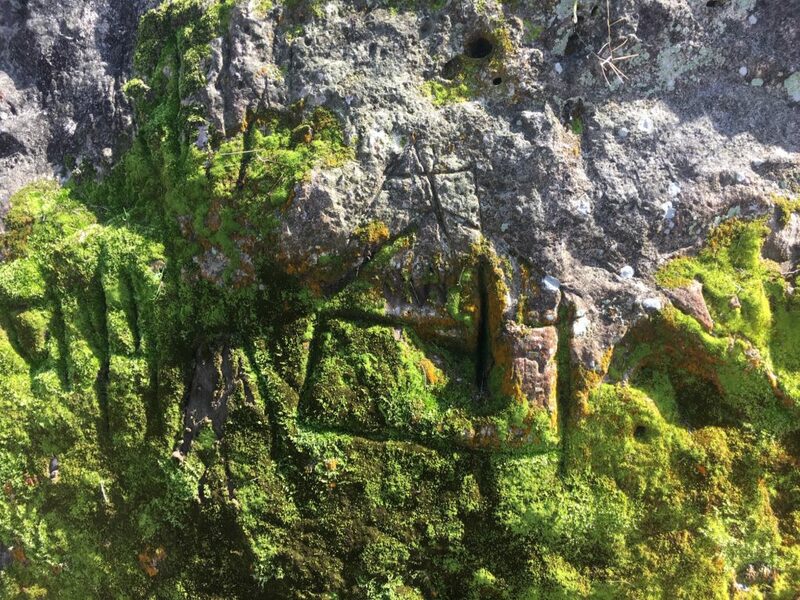 Some of the stones uncovered at Gault have rewritten the history of New World settlement. Until recently it was thought that the first human inhabitants of the Americas crossed a land bridge connecting present day Siberia and Alaska. The Bering Land Bridge, as it is called, was exposed by low sea levels during the last Ice Age around 18,000 years ago. Canada was completely covered with glaciers until 13-14,000 years ago, so it would have been impossible for people to make their way to present day U.S. until then. The land bridge theory had been around since the colonial era, but the theory gained crucial evidence when in 1929 archaeologist Ridgely Whiteman identified the oldest stone tools ever found in the Americas at the time. The tools in question were spear points, Whitemen called them Clovis Points after Clove, New Mexico, a town near where the first specimens were identified. Over the years more of these points were discovered. They dated to between 12,800 and 13,500 years ago. A time span that fit nicely with the land bridge theory. So with the existence of a land bridge being confirmed and the presence of stone tools dating to a period when Glaciers had receded enough to allow humans to cross Canada into the present day U.S. being discovered, it seemed the mystery of how the Americas were settled had been solved. Then Clovis points were discovered associated with Mammoth skeletons and a popular legend began to form of a roaming hoard of hunter gatherers clad in furs and loincloths, invading the New World and exterminating giant beasts with their cool spears. Some archaeologists went as far as to blame humans for the extinction of Mammoths and other mega fauna in North America at the end of the last Ice Age. Pictograph carved into a limestone bluff probably in the 18th century. The image depicts a chapel. This theory of how Early Americans populated the New World went largely unchallenged, but as time went by more and more questions were raised in response to new discoveries that seemed to contradict it. Over the years a few archaeological sites popped up that supposedly predated the Clovis culture. Monte Verde, discovered in Southern Chile in 1975, dates to at least 14,000 years ago. Artifacts from Meadowcroft rockshelter in Pennsylvania have been dated to 16,000 years ago. However, despite increasing evidence that the Americas were settled long before Clovis technology appeared, scholars stubbornly insisted that it was not possible for people to reach the Americas before 13, 500 years ago. The Clovis must have been the first gumans to people the Americas. Discoveries at the Gault site were the final nail in that theory’s coffin. More pre-Clovis artifacts have been discovered there than at any other site. In addition to absolute dating methods, the well preserved soil stratigraphy clearly shows the passing of time between when the pre-Clovis and Clovis artifacts were deposited. A paper published in 2011 by archaeologists working at Gault pretty much quashes any resistance to the idea that people were here long before Clovis points were being made and therefore probably before the Canadian glaciers receded enough for people to be able to traverse Canada by foot. So where does that leave us then? How did people get to the New World if they couldn’t walk? Aliens? Well the popular theory right now is that instead of traveling on foot from Siberia and gradually filling the landscape with their growing population, the first settlers in the Americas probably hugged the coast, maybe even hopping from shore to shore in boats. If they were doing that then maybe they could have floated around the Canadian Glaciers. Not only does this theory make sense, it also gives ancestral Native Americans the credit they deserve. For too long scholars have assumed that the first people to cross over into America must have been savage, Mammoth-killing brutes who simply blundered into a New World while following Mammoths (a bit like Columbus blundered into the New World looking for spices) but these settlers were smarter than that. They were explorers looking for a better place to live. 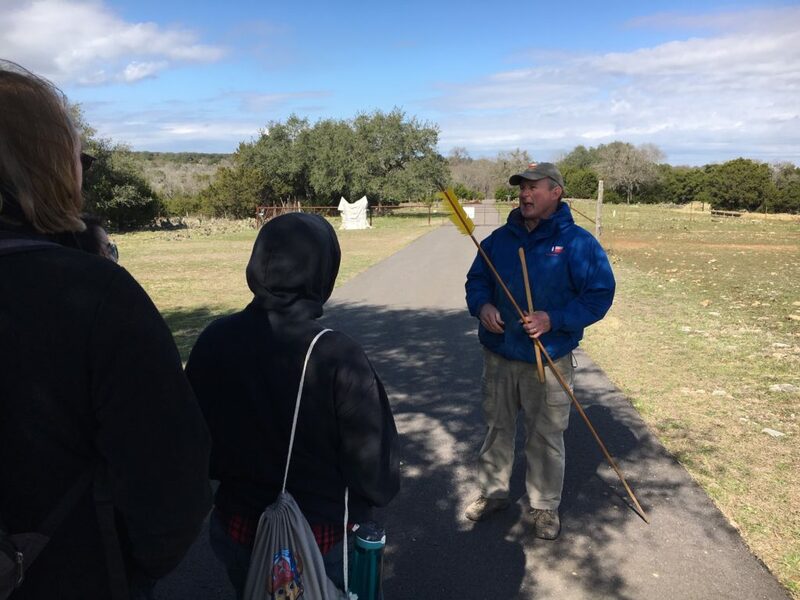 Dr. Werneke holding an atl atl, a spear throwing device that prehistoric inhavitants of the Americas used to throw their spears further. And on the subject of Mammoth killing, during our tour Dr. Werneke pointed out that there have only been 50 prehistoric Mammoth kill sites discovered in North America. There have been hundreds of kill sties of other animals such as ancient horses and camels (both of which lived in the Americas at the time) and even giant turtles. At the Gault site one juvenile Mammoth skull was discovered with evidence that the animal had been butchered, but many horse and turtle butcher sites were found. So it seems that mammoth were rarely killed by prehistoric North Americas. A far more likely explanation for the disappearance fo the beast was climate change. Evidence uncovered at the Gault site contradicts almost everything we thought we knew about the original settlers of the Americas. One our visit to the site, we were witnessing history in the making . It was an amazing experience. Trips like this allow our Discovery Guides get down and dirty in the field so they can fully understand the what, where and why of all the topics we discuss in our exhibits. Their knowledge and experience is what make our guides so popular. Next time you visit the museum, you should check them out. Previous Post The Sensation Migration: How Chilis Rocked The World!